Mecavik hill located between Zlatibor and Tara is the place that famous director Emir Kusturica chose for his home. Houses in this town are original old village houses. Each of these houses has a purpose: gallery, library, cinema, shop, restaurant...Emir Kusturica ethno village - Drvengrad is a film ethno-village in Mokra Gora, built as a setting for Kusturicas film “Life is a Miracle”. 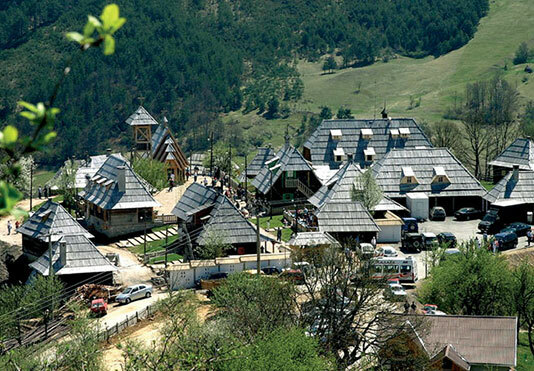 It is situated between Zlatibor and Tara and was erected on Mecavnik hill by the film director Emir Kusturica. Mecavnik rises above the village of Mokra Gora and is on the same altitude as the old railway station Jatare of the old narrow-gorge railway „Sargan Eight“. Drvengrad is an ethno village built in urban style. There is the entrance gate on one of its ends and on the other a small wooden church built in Russian style and dedicated to St. Sava. In the center there is a square with the ground made of wood and surrounded by authentic log cabins transported from regions in Serbia and Bosnia. Drvengrad has a picture gallery, a library, the cinema „Underground“, a pastry and sweets shop where home-made cakes and natural juices are served, a national restaurant and a souvenir shop. The expert jury of Brussels Foundation for Architecture „Philip Rotie“ proclaimed Drvengrad (Wooden City) the best European architectonic achievement in the last three years. Kusturica says about Drvengrad: „I have made up a town that looks as if people have always lived there“. 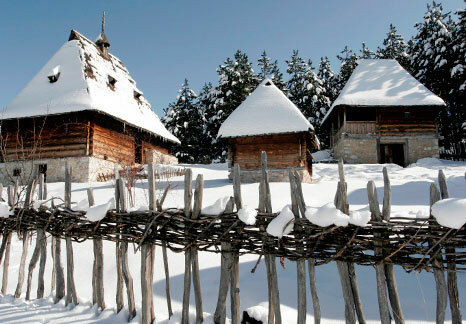 POpen museum Staro selo represents the museum of folk architecture from 19th century. Apart from traditional style houses, museum also works on preservation of the traditional crafts by making he copies of the items displayed in the museum. This place also hosts many cultural events. Some of the houses in the complex are used for accommodation of the visitors, and one of them is a home to an old tavern.